Sibbald’s back with the Bairns - but for how long? Craig Sibbald and Joe McKee shared a laugh at pre-season testing on Tuesday. Picture Michael Gillen. Craig Sibbald is training with Falkirk as the Bairns begin their pre-season schedule. The homegrown midfielder, out of contract but with the Bairns due a six-figure sum should he move clubs, was joined by the likes of Alex Harris, Nathan Austin and David Mitchell. Craig Sibbald took part in the Bairns preparations. Picture Michael Gillen. A deal offered by Falkirk secures the club’s right to training compensation fee should the midfielder move on, under the same FIFA training development ruling that Falkirk cashed in on six years ago with Mark Stewart’s transfer saga. In the past Oestersunds, Nottingham Forest, Rangers and Hibernian have been linked with the player, as were Fulham two years ago. Others are monitoring the situation, but Sibbald has remained a Bairn and could reach the 250 competitive match milestone if he stays on another year. Peter Houston said: “Sibbs is training with us and has been offered a contract. “If someone wanted him they’d need to pay money. Over the next few weeks he has a decision to make – he can’t walk out for nothing. “The club is due compensation which they are entitled to through the years and years of coaching and development and progression that’s been given to him. That’s a solution popular with Houston, from a Falkirk manager perspective and with the Bairns fans. But long-term the club could lose out on cashing in on their prized asset. And Houston reckons it’s that cash amount which is giving the Bairns a glimmer of hope of keeping Sibbald another year. Peter Houston has been speaking to the player over his contract limbo. Picture Michael Gillen. “In Scotland there’s not a lot of money going round and I can understand to a degree why people will maybe wait another year for him. “If Craig Sibbald was available free right now with no compensation he’d be playing Premier next season. If I was in the Premier with a different club I’d take him. I’d have done it by now too. I’d probably have pre-contracted him. That’s me, my opinion, not everyone’s, because I know what he can do. “He is solid, not frightened to take a knock, skillful, talented and our top scorer last season. 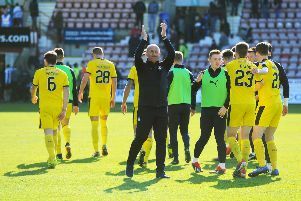 He trained with Falkirk for their home pre-season sessions -- but didn't travel to Hungary with the Bairns. Picture Michael Gillen. From a selfish perspective that suits Houston, but the current status of limbo leaves his plans as uncertain as Sibbald’s future. “I can’t plan. If he goes I’ve got his wages. If he doesn’t I can’t bring anyone else in. There are players I’d like but only if he left and I had his salary to use. For a manager who wants to win the league next season, it makes things difficult. “I feel for him. It’s awkward. We’ve sat down and talked he listens, he asks, but there’s only so much I can advise him.He does need to challenge himself at a higher level, I’m being honest. It could be easy for me to say stay another year. “He’s in a difficult situation so that he starts earning money again one way or the other. “What I have spoken to him about though is if he does come back into the fold I don’t want a disappointed player. I want someone hungry to take us up to the Premiership. “It’s no use to me if he stays and doesn’t really want to sign because he’s due a move and done enough to deserve one. I’d shake his hand on the way out if he left because he’s been absolutely superb for me in the past three years. Fans would be keen ofr the homegrown midfielder to stay at Westfield. Picture Michael Gillen. “If he wants to stay on he has to be absolutely superb for me in a fourth year.